"I do not believe in vampires nor do I encourage drinking blood!" Extended Family (the Gothic can appear in the most hygienic of surroundings…) in Exotic Gothic 3 edited by Danel Olson published by Ashtree Press. Using dramatic reconstruction, forensic science and historical research, 'Buffy' actor Anthony Head travels the world in search of the true stories that lie behind the myths of vampires, demons, witches, werewolves and zombies. 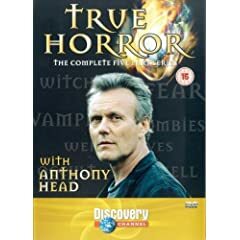 I talk to Anthony Head in the Vampires episode. Shown on the Discovery channel. The Vampire and the Voivode, Teleg Films is billed as "the first documentary ever to reveal the true story of Bram Stoker and his legendary novel." It is produced and directed by Michael Bayley Hughes. I can be seen walking round London, talking about sites associated with Bram Stoker and Dracula. Dr Who: The E Space Trilogy – talking in The Leaves of Blood section about the history of vampire fiction, along with authors like Ramsey Campbell, Kim Newman, Steve Gallagher, and others. I have been involved in quite a lot of vampire related activity. The Mammoth Book of Vampires, edited by Stephen Jones, which includes my story A Trick of the Dark has been translated into Russian and published with this lovely cover (right). I have been interviewed for a documentary on Bram Stoker and Dracula and done some sound bites for a BBC DVD package on Dr Who. Later this year I hope to be involved in an independent vampire film, Dead Girls of London. Meanwhile I have, with my husband Tony, and friend Kevin, recorded my account of the birth (fledging?) of the romantic vampire in 1816 at the Villa Diodati: An evening at Diodati. Press the button on the right to play and the one on the left to stop. "The theme of the stories are varied, moving from classic horror to purely revolting (but excellently written) prose to cultural fantasy. What does not very, however, is that each author knows his/her business. Choosing the most impressive story from this volume is an exercise in futility. They're all very good, otherwise they wouldn't be here. There are, however, a few stories that rise at least a few breaths above the others. Standouts in this forty-four piece collection include Douglas Clegg's "The Skin of the World", Richard Muller's "And the Sea Shall Give Up Its Dead," and that they belong next to the greats with stories such as Tina Rath's haunting tale A TRICK OF THE DARK," and Melanie Fazi's "The Cajun Knot". See Dr Rath on Dracula in The Sacramento Bee (Sac Ticket//SRAI//In a dramatic vein) and on Chicago Radio: Wgnradioscom-Radio 720 WGN - Chicago's News and Talk at Halloween. CONVENTIONAL VAMPIRES has been nominated as one of the best anthologies of the year by the British Fantasy Society and one of the stories (Mike Chislett's MARA) has been chosen by Steven Jones for this year's BEST NEW HORROR. The Mammoth Book of Vampires, edited by Steve Jones, published in June 2004 by Robinson (UK) and Carroll and Graf (USA) contains her TRICK OF THE DARK and Great Ghost Stories, edited by Steve Jones and R Chetwynd Hayes (a reprint of some of the ghost stories originally published by the late, great Chetwynd-Hayes) published Junes 2004 by Cemetery Dance Books, USA and Carroll and Graf USA, contains her "intricately plotted" short story of love and murder THE FETCH. Tina has edited a book of short, completely original vampire stories, which have been produced to celebrate the Dracula Society's 30th Anniversary Convention. Entitled CONVENTIONAL VAMPIRES it is available at £5.00 plus p&p from the Dracula Society, PO Box 30848, London, W12 OGY. "Every single piece in this book is of a high standard and very well written ... I would very much recommend this for anyone who loves vampires and short stories - you will not be disappointed." "The well known talents of Tina Rath are richly reinforced by one of the cleverest weird tales it has been my pleasure to read: "Mr Manpferdit" skilfully captures the freakishness of seedy eighteenth century London in a laconic character study of Dr Johnson and the lecherous Boswell as they go off in search of something more esoteric than a night on the town; after reading this story one might indeed agree with the good doctor that "he who is tired of London is tired of life"